Pannexin proteins comprise a family of channels whose sole function, to date, is the release of nucleotides (e.g., adenosine 5'-triphosphate [ATP] and uridine 5′-triphosphate [UTP]). With purinergic signaling being such a prevalent form of cellular communication, it is hard to image why a channel dedicated to the release of nucleotides has not been previously identified. However, with their topography and discovery being lumped with the gap junction field (i.e., connexin), they were thought for a long time to be more similar to connexin-based proteins. It is now known that there is a distinct difference between pannexins and connexins. Unlike connexin hemichannels (undocked gap junctions), pannexins can open under physiological Ca2+ levels. With their distribution being nearly ubiquitous across the vasculature and importance of purinergic signaling in the vasculature, it is easy to see why pannexin channels may be, especially, important. In this mini-review, we highlight what we know about the cell biology of pannexins, followed closely by what is known about pannexins in the vasculature in regards to its importance in vascular physiology. Background: In spite of being the oldest neurological disorder to be recorded in human history, the pathophysiology of migraine headache is not clear. In recent times, hereto unexplored mechanisms are being pursued to explain the disorder. Novel thinkers have ventured to associate migraine with chronic infection induced hypersensitivity. Infections such as Helicobacter pylori and Chlamydia have been found to be more common in migraine patients. We wanted to know whether there is any abnormal nasal bacterial colonization associated with migraine. Methods: As a single-blinded, cross-sectional, observational case–control pilot study in a tertiary government hospital neurology outpatient department in India, we analyzed the nasal bacterial flora of 27 migraine patients and ten relatives of these patients without migraine headache by nasal swab smear and culture. Results: The organisms detected in the participants were coagulase negative Staphylococcus and Staphylococcus aureus, Viridans streptococci, diphtheroids, micrococci, bacteroides, and Klebsiella by culture. Bacterial flora of the migraine patients was different from that of the controls, especially diphtheroids (migraine = 11% vs. control = 40%, P = 0.06) and micrococci (migraine = 30% versus control = 60%, P = 0.13) seem to be lower in migraineurs than in controls. Conclusions: From our pilot case–control study, although a small sample size of patients, migraineurs appear to have altered bacterial flora in their nose. Introduction: Oral squamous cell carcinomas (OSCCs) are malignancies which develop predominantly from preexisting potentially malignant disorders. Immunoglobulin A (IgA) in saliva and serum is responsible for local immune response. 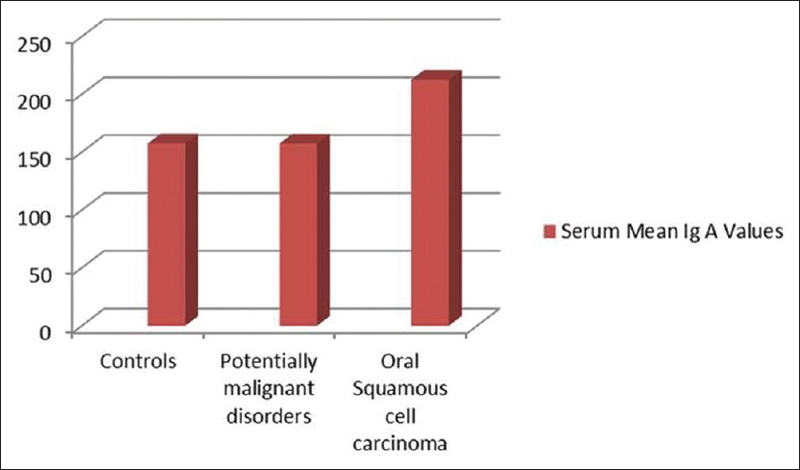 The present study evaluates the role of serum and salivary IgA in OSCC and oral potentially malignant disorders (OPMDs). Materials and Methods: Ninety individuals were recruited into the study in three groups of thirty each. The participants were categorized as control group, study Group I consisting of OPMDs, and study Group II consisting of OSCC. Serum and salivary IgA was analyzed using nephelometry. Results: Serum IgA showed statistically significant increase between controls and study Group II and between study Group I and study Group II (P < 0.05). Salivary IgA showed statistically significant difference between controls and study Group I and between controls and study Group II (P < 0.05). Conclusion: The results show increased serum IgA in OSCC group as compared to controls while salivary IgA increased in both OPMD and OSCC groups. Thus, the present study indicates a role for serum IgA in OSCC while salivary IgA has potential as a prognostic indicator in OPMDs and OSCCs. Mucoepidermoid carcinoma of the lung (MEC) is a tumor of low-malignant potential of bronchial gland origin. Low-grade MEC has a better prognosis than high-grade tumor, the later being similar to that of nonsmall cell lung carcinoma. We report a case of 14-year-old girl who presented with cough along with expectoration and dyspnea. 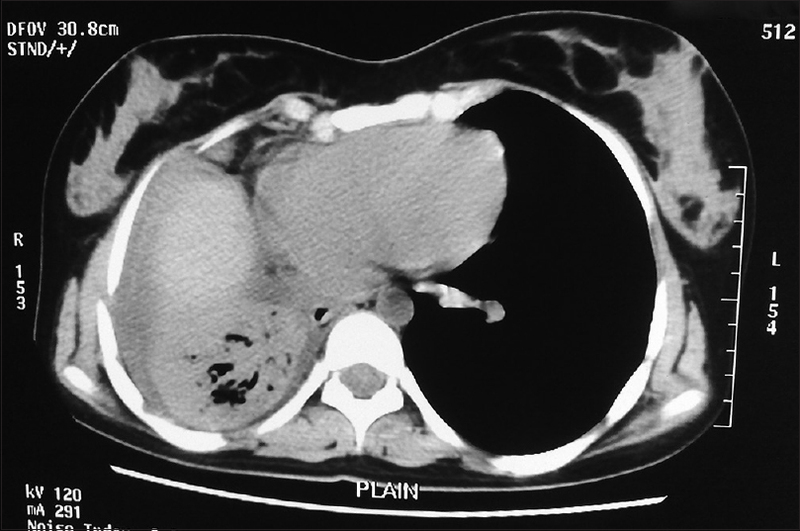 Imaging studies revealed a mass involving the right upper lobe bronchus. 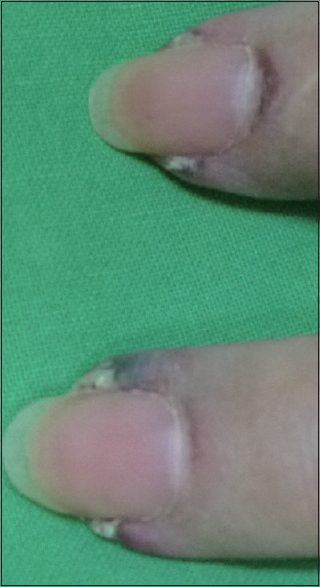 Surgical resection was done and pathological examination revealed an intermediate-grade MEC with tumor-free margins. No adjuvant treatment was considered. The patient had no signs of tumor recurrence with 1-year follow-up. 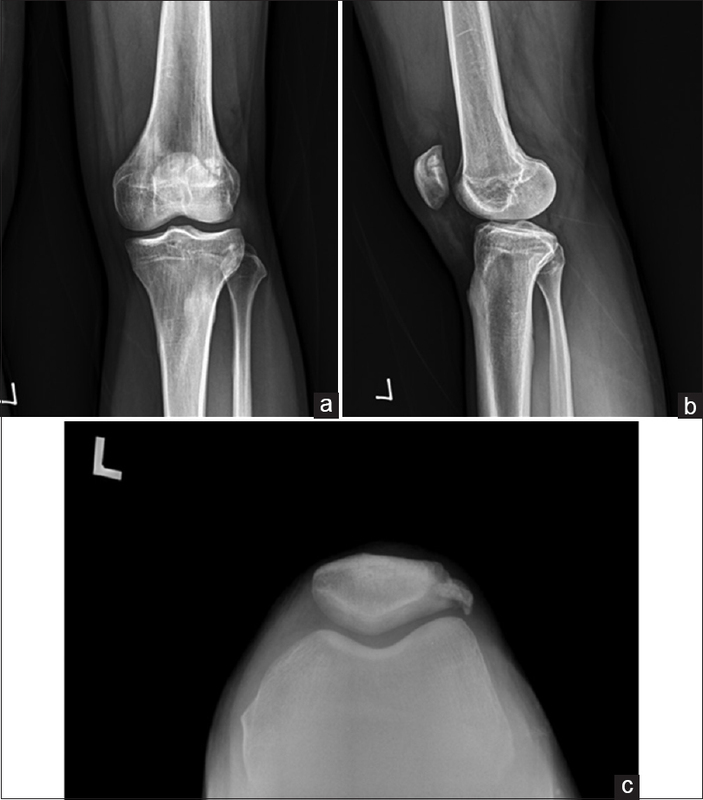 We report the case of 32-year-old male who had a painful knee due to tophus formation in the interosseous area of the bipartite patella. There was neither a history of previous trauma to his patella nor a family history of gouty arthritis. Intraoperatively, we found chalky white-yellow material deposited at the bipartite space and it was curetted. The second part of the patella was fixed by a screw for functional preservation. In addition, hyperuricemia was also noted and controlled by uricosuric agents postoperatively. Gout should be included in the differential diagnosis of painful bipartite patella, and we suggest surgical intervention in combination with antihyperuricemic therapy for tophaceous deposits of the bipartite patella. In this case report, we describe a rare clinical situation of acute arterial thoracic outlet syndrome (TOS) after osteosynthesis, using an intramedullary Knowles pin, to treat nonunion of a midshaft clavicular fracture. 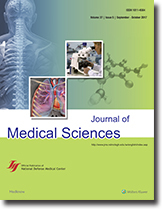 Existing evidence was reviewed to appraise the relationship between TOS and nonunion of clavicular fractures, including the timing of the development of this complication, as well as to identify the relationship between surgical technique and choice of implant and the occurrence of TOS. Perioperative measures used to prevent TOS were identified. Patients with serum anti-melanoma differentiation-associated gene 5 autoantibodies (anti-MDA5) are related to amyopathic dermatomyositis, especially in Asians. Here, we present a 46-year-old woman who was diagnosed with anti-MDA5-mediated demyelinating polyneuropathy clinically mimicking dermatomyositis. She had rapid progression of interstitial pneumonitis complicated with Pneumocystis jirovecii and Aspergillus pneumonia with septic shock. It is rare that patients with anti-MDA5-positive dermatomyositis present as demyelinating polyneuropathy.